All natural sweetener with just .4 net carbs per serving. 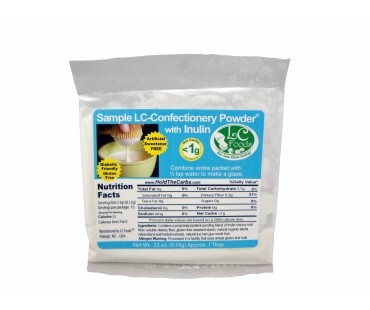 This is a 1 tablespoon sample of our all natural Low Carb Confectionery Powdered Sweetener - Inulin. Tastes so great you won't believe its low carb! No sugar alcohols. Contains stevia and luo han guo monk fruit with Inulin chicory root fiber as the base. Our Low Carb Confectionery Powdered Sweetener - Inulin has a healthy dose of dietary fiber. Contains a proprietary/patent pending blend of Inulin chicory root fiber, soluble dietary fiber, gluten free resistant starch, natural organic stevia rebaudiana leaf herbal extracts, natural luo han guo monk fruit.